Marketing has moved from the traditional transaction-based model to the dynamic role we know today. Interactive marketing is becoming a larger part of the marketing mix and by 2016, it is estimated that advertisers will spend $77 billion on interactive marketing – as much as they do on television today according to a study by Forrester Research. Georgia is helping to lead the way in this growing interactive marketing landscape which includes everything from marketing automation, mobile, and email marketing platforms, to web design, content marketing, and all forms of digital advertising. Georgia has evolved into a dominant East Coast digital marketing hub thanks to an ecosystem comprised of locally-based Fortune 500 companies, hundreds of marketing agencies, and more than a dozen regional and global media outlets and facilities. 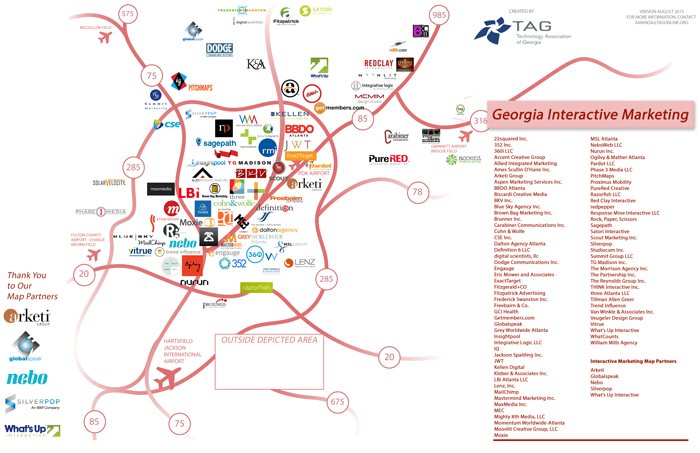 Interactive Marketing companies in Georgia also benefit from the state’s comprehensive technology infrastructure and diverse pipeline of talent matriculating from more than 15 Georgia colleges and universities that offer industry-related curriculum. Collectively this ecosystem helps to drive the marketing efforts of some of the most-recognizable brands in the world.